I honestly don’t remember much of the EX series since I haven’t played them in a while, save for EX 3 which is the copy I still have. C. Jack is one of the more memorable characters, and when I had the option to choose between him and Allen Snider, I chose Jack because he seems more original and appealing to me. Like most of the Arika characters, his back story and design change dramatically between the games, however his core personality hardly changes, and he’s unique in that he’s not quite good or bad. He’s just sort of in the grey, and he fights for himself not prepared to die fighting. The common theme in his design is inspired by Michael Jackson and Daisuke Jigen from Lupin III(one of my favorite anime) which I think is pretty awesome. 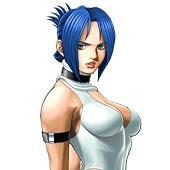 I played EX a few times when I was younger, and I used to get frustrated by it. 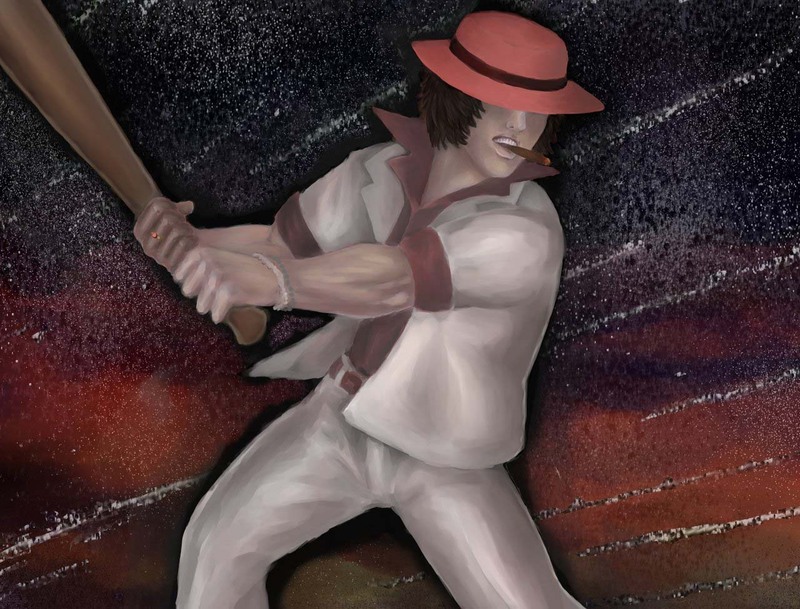 One of the coolest things about C.Jack was that he could hit someone with his bat into space, bounce off the surface of the moon, and come back down! (Let’s see Cody top that one) Hence the background looking like space or the night sky. The process was tedious and difficult, I myself not particularly experienced in digital media tried my hand at a digital painting in Illuststudio. I started with a rough on paper, scanned, then imported and painted over in a new layer in Illuststudio. I started with a neutral midtone for basic coloring of the figure, then started with lights and darks of the colors for highlights and shadows. This was before I knew how to incorporate line art into drawings, although I tried to compensate by using the street fighter 4 character selection images as a reference for the paint style. I used a reference for a sunset for clouds in the sky, which I made darker after painting and used the spray tool to create the stars and meteor/shooting star things. The whole thing is basically just a painting but in digital, so I used my understanding of those principles in drawing, so only about 2 layers remain the the finished work, not vectors or anything fancy, just plain old tablet drawing. The Street Fighter series has always been a standout for it’s character design and Capcom /Arika and their teams always set a high standard for their detail and talent. 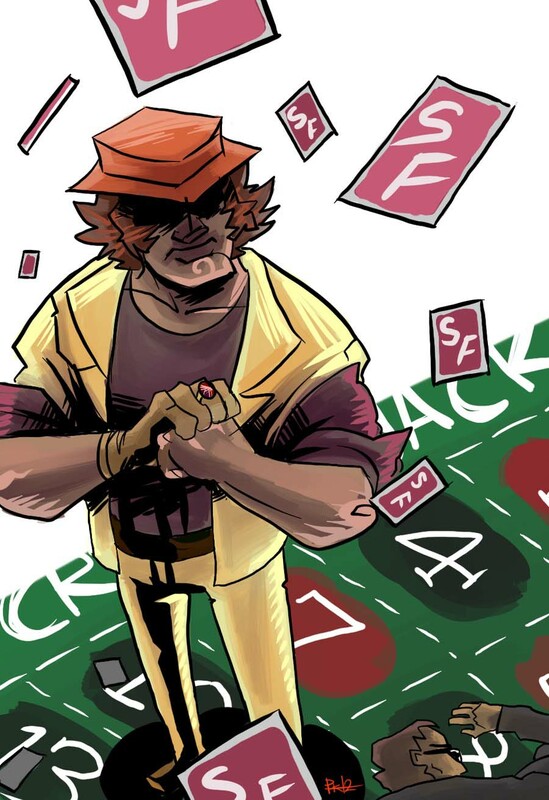 Cracker Jack is one of the many offbeat and edgier characters from the EX series. While they may not be the most prominent games in the series, the set of games are still a blast to play and are only waiting for more fans to discover them. Cracker Jack is a casino bouncer. He’s a big brute of a guy, so I wanted him to look a little menacing while still keeping that cartoony SF vibe. The cards, knocked out bouncer and roulette table pattern were added in just to give you a feel about what this guy is all about. It was drawn and coloured in Paint Tool Sai.